A beverage cooler allows you to offer patrons a variety of cold drinks. If you’re just opening up your establishment or looking to replace an older cooler, you may not know what to look for when comparing models. Because you’re searching for a commercial-grade beverage cooler, there are several things you’ll want to keep in mind when weighing your options. Capacity: The cooler’s capacity should be the first thing you consider. All models will list their capacity in cubic feet, but some will also tell you how many cans or bottles it can hold. If you run a smaller establishment, a simple 8.6 cu. ft. cooler may do the trick, but larger stores and restaurants will likely need between 12 and 19 cu. ft.
Security: What type of security measures are offered? Security becomes particularly important when theft is a problem. Most models will come with a set of locks and keys, or other security measures to help prevent theft. Temperature Range: Another important thing to consider is the temperature range the cooler offers. Most will offer a range between ~30F and ~40F, but you’ll want to check to make sure the cooler is cold enough for the beverages you want to store. Warranty: When buying commercial equipment, it’s important to ensure that the item is backed by a good warranty. Commercial environments can be very demanding, so you want to ensure that your purchase is protected. If something goes wrong with the compressor within the first year of use, you want to be sure that it can be replaced or repaired under the warranty. EdgeStar 14 Cu. Ft. Beverage Merchandiser – Featuring a generous 14 cu. 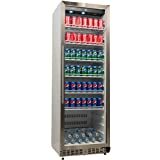 ft. capacity, this EdgeStar beverage merchandiser is rated for commercial use and is built-in capable. With a sleek white cabinet and stainless steel trim, this cooler blends in perfectly with any store decor. For added security, this cooler offers a security lock and dual pane glass. It also offers a temperature alarm to alert you when temperatures move out of the desired range. Forced air cooling keeps beverages cold, while the interior LED lighting allows customers to see your offerings no matter the indoor lighting conditions. This cooler features a smart control panel with a digital display, six wire shelves and four leveling gaps. With a temperature range of 36F-43F, this cooler is a smart choice for any commercial establishment. EdgeStar 8.6 Cu. Ft. Beverage Merchandiser – Another great option from EdgeStar, this beverage merchandiser has a little less space than the previous cooler, but offers many of the same great features. Designed for freestanding use only, this cooler offers an 8 cu. ft. capacity. Four wire shelves and four leveling legs are included with this refrigerator, which offers a white interior and stainless steel trim. Dual pane glass and a security lock keep beverages secure. This model also offers a control panel with a digital display, a temperature alarm and a temperature range of 36F – 43F. If you’re looking for a quality beverage cooler but don’t need a 14 cu. ft. capacity, this model is a great option. 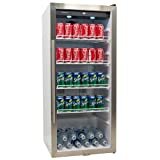 UBB-24-72G 72″ Commercial 3 Door Back Bar Cooler Refrigerator – This 72” commercial cooler offers a high capacity of 19.6 cu. ft., making it ideal for larger commercial establishments and bars. This cooler features three glass doors, a stainless steel top and swing doors. With a temperature range of 33F – 41F, this model is the ideal beer bottle fridge. A total of six shelves are offered, with a product capacity of 1152 – 12-ounce cans, 624 – 12 oz. bottles, or 3 – kegs. Two shelves in each section are adjustable for added convenience. With a 1/3 HP compressor, this model is a great option for busier establishments, such as restaurants and bars. EdgeStar 11.2 Cu. Ft. Beverage Merchandiser – EdgeStar’s 11.2 cu. ft. beverage merchandiser is built-in capable and commercial rated. With even forced air cooling and a temperature range of 36F-43F, this cooler fits well in both store and restaurant settings. Sleek and modern, this cooler offers a white interior and stainless steel exterior. Dual pane glass and a security lock keep beverages safe and secure, while the interior LED lighting allows patrons to see inside the cooler. A temperature alarm alerts you when the internal temperature falls out of the desired range. 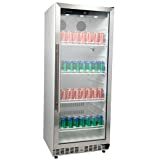 Four leveling legs and four wire shelves are included with this ETL and ETL-S approved refrigerator. Procool 12.7 Cubic Ft. Beverage Cooler – Procool’s 12.7 cu. ft. beverage cooler features a white interior and black trim with a fan-assisted cooling system. Suitable for tropical areas, this cooler offers an inside fan for ventilation and a manual controller that allows you to adjust the interior temperature. A lock and key are included, and the inside of the refrigerator also features a vertical light for added illumination. The outer tempered glass door is double glazed and self-closing for added convenience. A self-evaporation water tray is also included, and the doors are designed to avoid condensation. This cooler sits atop four caster wheels, and two of them have built-in brakes to keep it securely in place. The lighted canopy at the top of the machine allows you to display the advertisement of your choice, making this a great option for stores. Shelves: How many shelves are included? Most will offer at least four, and some are adjustable. Depending on your needs and use, you may prefer a model that allows you to adjust the height in between shelves. In either case, it’s important to estimate how many beverages you plan on storing and then determining how many shelves you will need. Wheels: Some coolers come with wheels, like the Procool model, which makes it easier to move the unit around. Others have standard legs that can be more difficult to move. If you plan on using it as a built-in unit or keeping it in one place for the long-term, a model without wheels will work perfectly fine. Lights: Ideally, you want to choose a model that offers adequate interior lighting, particularly if you’re using the unit in a bar or dimly lit establishment. Good interior lighting will make it easy to see the refrigerator’s contents. Keep in mind that some models, like the Procool, also have a lighted canopy that allows you to display an advertisement of the beverages stored inside. Price: Finally, consider the cost of the unit. Expect to spend at least $1,000 on a good cooler with all of the basic features you’ll need. You’ve likely already set a budget for this purchase, so aim to find a model that offers the best quality and durability in your price range.